Opiate addiction is a growing concern in the United States, where we consume the highest number of opiates of any other country in the world. It’s estimated that more than 2 million people in the United States are struggling with opiate addiction. Many of these addictions start innocently. Maybe the person was prescribed a narcotic painkiller such as hydrocodone or oxycodone for something like back pain from a well-meaning doctor. Maybe they got one or two from a friend. Over time they discovered that one pain was no longer enough, so they started taking two, then three, and more and more each day to manage their pain and achieve the same level of relief they got from the first pill. Sometimes, the pills are no longer being used to treat pain at all. Opiates cause our bodies to dump endorphins into our bloodstream, the hormone that makes us feel happy and at peace. The patient wants to gain that feeling again and again, something the body is unable to do on it’s own at those high levels. That means taking more and more of the opiates to acheive the same feeling. Often without even realizing that it’s happening, their body is addicted to the substance and they struggle to go a day without it. That scenario is playing out all over the country, and opiate addiction is becoming such a big problem that the federal government is looking for ways to step in. More doctors are now aware of the potential addiction issues of these painkillers and are doing their part in curbing the supply. But for someone who is already addicted, it’s now a matter of seeking treatment for their addiction. There are a number of treatment options available, including outpatient treatments through our Tucson men’s health clinic. When it comes to addiction treatment, there are two main options: inpatient or outpatient. The methodologies used in these two categories may vary from clinic to clinic, but deciding whether inpatient or outpatient treatment is best for you is a good first step towards finding the right clinic. Inpatient treatments require that you live in the facility for the duration of your treatment. This can be a beneficial option if the withdrawal from the opiates is going to be severe and could require medical intervention; these facilities will be equipped to handle it. After the initial withdrawal, then the patient can start to undergo counseling such as talk therapy and group therapy that’s designed to help them overcome their addiction and give them tools they can use to maintain a clean lifestyle once treatment ends. Some of these facilities may offer outpatient services once the initial treatment ends in the form of ongoing therapy and support groups. Outpatient treatments are becoming more and more popular for opiate addictions. That’s due in part to the fact that many of the people who succumb to the addiction have no prior history of addiction and have admitted they have a problem at the early stages. Many of these people need to maintain their job while undergoing treatment, too, and outpatient treatments allow them to do so. It’s especially helpful if the patient has a strong support system at home, so they can receive the emotional support they need as they go through the program. It’s important to honestly evaluate yourself, your addiction, and your personal situation before you decide whether or not outpatient treatment is the best option. The outpatient treatment for opiate addiction can vary from clinic to clinic. In general, though, all treatments are going to begin with a detox process. This is when the opiates are leaving your body and you start to go through withdrawal. Depending on your level of addiction, the symptoms can range from mild to severe. However, the clinic can help you manage the withdrawal symptoms through medications such as suboxone. It’s a prescription medication that eases the withdrawal symptoms. Many patients find it much easier to overcome their addiction with the help of this drug, as they aren’t tempted to use an opiate to relieve their withdrawal. Because these medications, usually Suboxone, only require you to visit the doctor’s office periodically, you don’t have to enter into a long-term or residential treatment program to get help. That makes it more convenient and eliminates any waiting periods. In addition to managing the symptoms of withdrawal, it’s a good idea to seek counseling both during and after the treatment. This can help you stay off of opiates and overcome any underlying issues that may have made you vulnerable to addiction in the first place. Overcoming opiate addiction isn’t easy, but with the right support and treatment, it’s definitely possible. It’s important to go into the treatment process (whether it’s inpatient or outpatient) with the right positive attitude that you can and you will be able to end the addition and regain control over your life. Are You Looking for Outpatient Opiate Addiction Treatment in Tucson? It’s important to find a clinic that you feel is a good match for your own needs. You should always feel free to ask a lot of questions when discussing treatment with clinics. 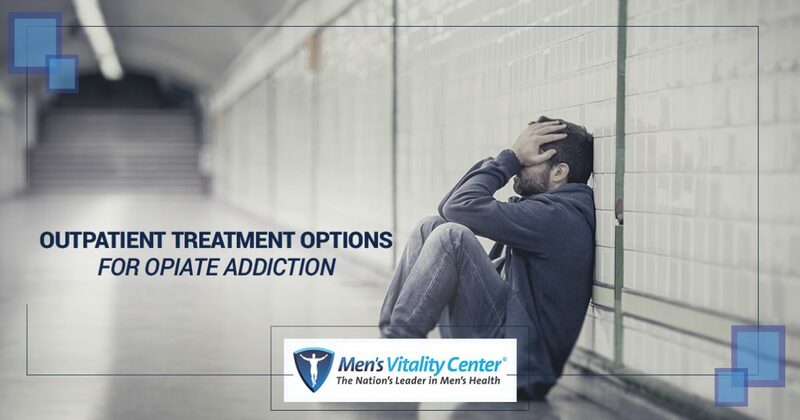 If you decide to pursue outpatient treatment, Men’s Vitality Center in Tucson offers a treatment program that may be right for you. We offer outpatient Suboxone treatment to help you curb withdrawal symptoms and end your addiction to prescription pain pills. If you or a loved one are currently struggling with a pain pill addiction, get in touch with our clinic today. You can give us a call or contact us through our website for more information on our treatment program and how we may be able to help.